DES MOINES – The price of natural gas rose $1.19 this week, a 34% increase, currently at $4.71/MMbtu. The price of global crude oil fell this week on the West Texas Intermediate (WTI) by $5.20 per barrel over last week, currently priced at $56.74. Brent crude oil fell $5.43 and is currently priced at $66.78. One year ago, WTI crude sold for $55.70 and Brent crude was at $60.91. As of Tuesday, November 13, the price of regular unleaded gasoline averaged $2.51 across Iowa according to AAA. This is $.11 lower than last week and $.03 lower than one year ago. The national average on Tuesday was $2.68, down $.07 from last week’s price. Retail diesel fuel prices in Iowa were $.04 lower than last week’s price with a statewide average of $3.20. One year ago, diesel prices averaged $2.82 in Iowa. The current Iowa diesel price is $.05 less than the national average of $3.25. Wholesale ethanol prices were $.03 lower than last week’s price, currently at $1.24. 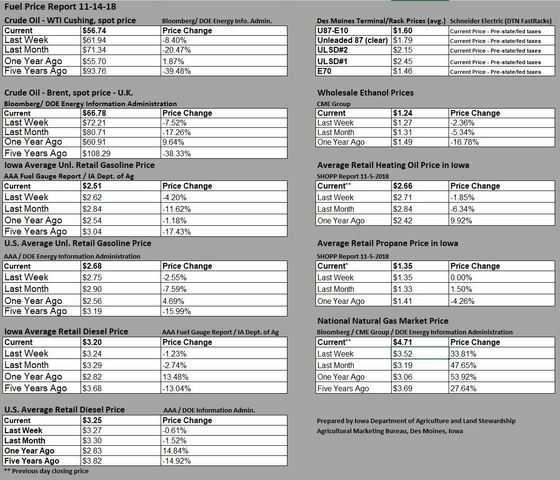 The current Des Moines Terminal/Rack Prices are $1.60 for U87-E10, $1.79 for Unleaded 87 (clear), ULSD#2 is at $2.15, ULSD#1 is at $2.45, and E-70 is priced at $1.46 per gallon. Propane prices remained steady from last week for a statewide average of $1.35 per gallon. Home heating oil was down $.05 from last week’s figures, ending with a statewide average of $2.66. Natural Gas prices rose $1.19 at the Henry Hub reporting site and currently priced at $4.71/MMbtu.